Complete newb here, so I thought instead of trying to describe it I would just provide some pictures. I bought it at lowes when it was just a tiny sprout with two leaves each only about an inch long. 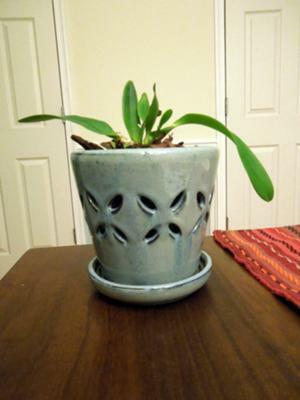 So I'm guessing from what I've researched that it is a phalaenopsis. It is only about 8-10 months old in those pictures and obviously hasn't bloomed yet. Any help would be greatly appreciated. Also, I know I shouldn't have put it in that big of a pot, but it seems to be happy so I've left it alone so far. Thank you! 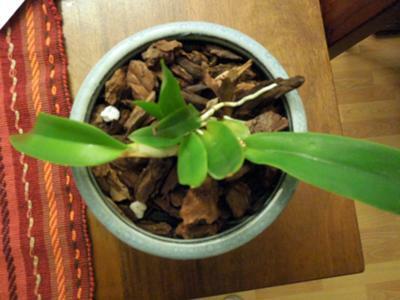 This plant is definitely not a Phalaenopsis, because it has a sympodial growth habit and pseudobulbs. It is most likely an Oncidium, though it's hard to know without seeing the flowers. Care for Oncidiums is as for Phalaenopsis, except that they like more light and somewhat cooler temperatures. A slight dry rest after flowering is also appreciated.